Professionally handle your own business. All departments in the organization are joined and share the information together. 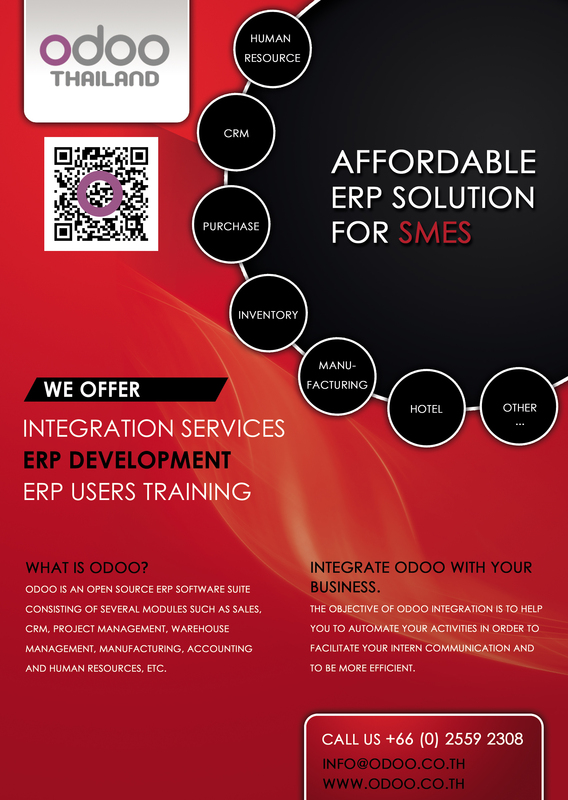 Odoo is an open source ERP software suite consisting of several modules such as Sales, CRM, Project management, Warehouse management, Manufacturing, Accounting and Human Resources, etc. ERP, Enterprise Resource Planning is a business management system that integrates diverse systems across the enterprise into one system. The business activities such as inventory control, order tracking, customer service, finance and human resources can be automated process with workflow. All departments in the organization are joined and share the information together. ￼Frontware organizes presentation and demonstration sessions once a month. These sessions are free, we organize it in our office in Bangkok. Feel free to register. Click here to easily get direction from your location to our office.